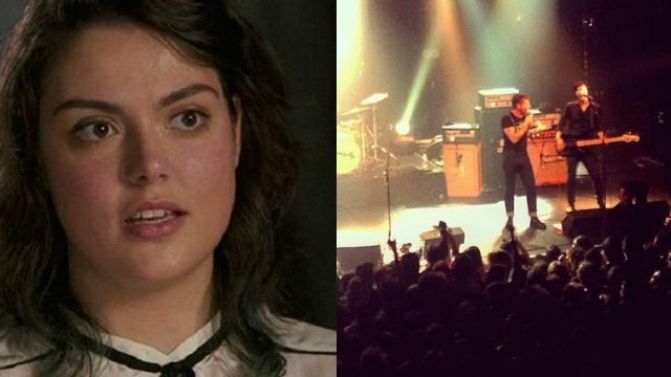 Tasmanian teenager Emma Parkinson has recounted her terrifying experiences inside Paris’s Bataclan Theatre, when terrorists opened fire and massacred 89 Eagles Of Death Metal fans. In an interview with 60 Minutes, the 19-year-old explained that she was only a few short metres from the front of the stage when she heard the sound of gunfire. “I thought someone had fireworks. You know, like just little fireworks that you buy at the supermarket,” she told Nine. After it became clear that the sound was gunfire, Parkinson cowered on the ground, before trying to make a break for it over a barrier, at which point she got stuck, and got shot. “It just sort of came through my head, ‘OK, I’ve been shot, did it hit anything important? Probably not … gotta keep going’,” she said. Recounting the events that followed, she described horrifying scenes of blood everywhere as people scrambled to escape the unfolding attack. The teen eventually escaped to a nearby building where she hid with other concert-goers, many of whom – like herself – had been shot. “It just hit me, I just grabbed the first person I knew and just hugged them,” she said. “I think I was swearing a lot in English, so he knew I was not French. “And this guy just grabbed me and said, ‘It’s OK, it’s over. You’re going to be fine’. Four Daesh terrorists were killed as police stormed The Bataclan — three by activating their suicide vests, while a fourth was shot dead. Meanwhile, Eagles Of Death Metal’s Josh Homme and Jesse Hughes have given their emotional first interview since the shootings. In a trailer for the interview, Hughes told Vice magazine that several punters had fled backstage to hide inside the band’s dressing room, only to be hunted down and killed by the attackers. “A great reason why so many were killed is because so many people wouldn’t leave their friends, so many people put themselves in front of people,” he said. Hughes said just one person survived inside the dressing room, apparently by hiding under his leather jacket. Watch a section of Emma Parkinson’s 60 Minutes interview, below.